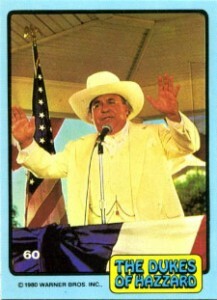 1980 Donruss Dukes of Hazzard trading cards is the first of three sets released by the card maker. It's a simple set that doesn't offer much beyond images. Cards fronts are very basic. Blue borders surround an image that's either from the show or, more likely, a promo shot taken on set. Most pictures are posed portraits. Factor in the fact that a lot of the shots are very similar with only a slight move (the case with a lot of the cards centered on the General Lee) or different cropping. It shouldn't be surprising that Daisy gets just as much attention as her cousins, Bo and Luke Duke. 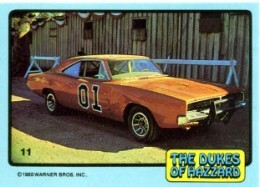 A number and the Dukes of Hazzard logo are the only other notable features on the card fronts. Backs piece together to form one massive puzzle. The 1980 Donruss Dukes of Hazzard set has a total of 66 cards. 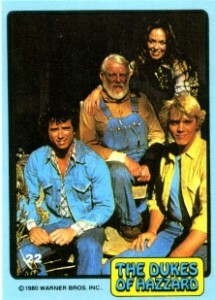 Wax packs are blue with illustrations of Bo, Luke, Daisy and the General Lee. 1980 THE DUKES OF HAZZARD CARD LOT of 40 cards. TV SHOW! 66 cards. Blue borders. Shop for complete sets on eBay. I have 45 packs of bubblegum Dukes of Hazzard cards in good condition, and the box with is in OK condition.. Any interest? I have two Dukes trading cards. #10 and #23, both in good condition. Any interest in these? I have an orange duke of hazard toy guitar. Was wondering what the value of it is.